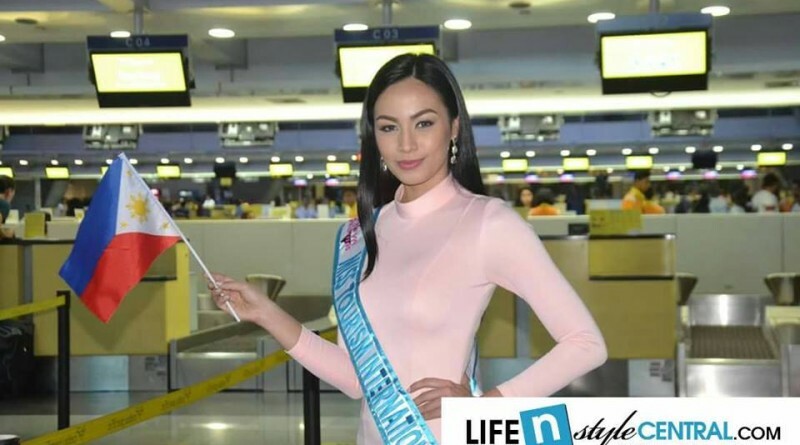 Reigning Mutya ng Pilipinas – Tourism International Justine Mae “Jaya” San Jose left for Kuala Lumpur, Malaysia last night, December 13, to join the other girls from different countries all over the world for the Miss Tourism International 2016 pageant. Many expects her to bring another pride to the Philippines, after all the successes of Filipina beauty queens in the international pageant arena. Jaya San Jose during send-off press con at NAIA. From the time that she won her “mutya” crown to the time she left to compete abroad, Jaya was shown with overwhelming confidence and queenly attitude and aura after going through rigid training in preparation for her international stint. The coronation night of Miss Tourism International 2016 is slated on December 31, 2016, also in time for the New Year’s eve celebration for many. The nineteen year old lass was born in her mother’s hometown, Mamburao Occidental, Mindoro. But after 2 yrs their family moved to her father’s hometown in Pila, Laguna. Jaya grew up in Doha, Qatar from age 4. She studied her pre-school until she graduated high school in Philippine School Doha. Jaya started modeling at age 14. With her wide experience in doing ramp, pictorials, movies and photoshoots added up to her good credentials in the fashion world. She is a freelance model in Doha and in the Philippines. She returned to the Philippines last 2012 to start her intermediate studies in Colegio de San Juan de letran taking up Bachelor of Arts in Communication. The members of the Philippine media who attended the her send-off party were pretty amazed and stunned by her personality and good stance, most particularly during the interview session. She has the wit and charm of a genuine Filipina, and no wonder, many were positive that she would do good come pageant night in Malaysia, and might eventually bring home the crown for the Philippines. Her eloquence, elegance, fierceness, confidence and striking beauty would serve as her best assets to reign supreme among other contestants on the finals night. Present during her send-off were Mutya ng Pilipinas officials headed by Ms. Mayenne Vijandre along with Ms. Maricel Ang and Namkeen Hameed, as well as her family and friends. Thanks for all of the work on this web site. Kim delights in making time for internet research and it’s easy to see why. Many of us learn all of the dynamic manner you convey both useful and interesting suggestions by means of the web site and as well as encourage contribution from some other people on that area of interest then our favorite girl has been studying a great deal. Take advantage of the rest of the year. You’re performing a splendid job. My wife and i ended up being absolutely relieved Ervin managed to carry out his web research from your ideas he had in your weblog. It is now and again perplexing to just possibly be giving away helpful tips which often other people might have been selling. We really take into account we’ve got you to be grateful to for that. The illustrations you have made, the straightforward web site menu, the relationships you can make it possible to foster – it’s got everything astounding, and it’s really assisting our son and the family imagine that this concept is cool, and that is quite mandatory. Thanks for all the pieces! I intended to post you one little bit of remark to say thanks again just for the exceptional knowledge you have discussed at this time. It was strangely generous with people like you to convey openly precisely what many people might have made available as an electronic book to earn some profit for themselves, certainly given that you might have done it in the event you desired. The creative ideas additionally worked to provide a good way to understand that other people have similar dreams like mine to know many more around this problem. I’m certain there are several more pleasant times ahead for folks who read carefully your website. Thank you so much for giving everyone such a spectacular chance to read critical reviews from this site. It is always so pleasing plus packed with a great time for me and my office peers to visit your web site more than three times in one week to find out the newest guidance you will have. And lastly, we’re at all times contented concerning the astonishing information served by you. Selected 4 facts in this post are without a doubt the simplest we’ve had. I wanted to send you this little word to help say thanks a lot over again about the magnificent solutions you have contributed on this website. It was quite particularly open-handed of people like you to grant unreservedly what exactly a number of people could possibly have marketed as an e book in order to make some money on their own, certainly given that you might well have done it in case you desired. These solutions additionally worked like a great way to fully grasp that some people have the identical passion like my very own to find out many more with respect to this matter. I am sure there are numerous more enjoyable times ahead for individuals who read carefully your blog post. I simply desired to appreciate you once again. I am not sure the things I might have followed without the type of advice shown by you relating to such a subject matter. It previously was an absolute daunting difficulty for me, however , encountering a new expert strategy you managed it took me to leap for contentment. I am happy for this service and as well , trust you find out what a great job your are doing training many people all through your website. Most probably you haven’t encountered any of us. Thanks for all your work on this blog. Ellie enjoys making time for investigation and it’s obvious why. We all learn all relating to the lively mode you render worthwhile ideas via this website and as well as inspire participation from other people about this situation while our child is now understanding a whole lot. Enjoy the rest of the year. You are doing a very good job. Thank you so much for giving everyone remarkably splendid chance to read from this web site. It’s always so brilliant and also stuffed with a great time for me and my office acquaintances to visit the blog no less than 3 times in one week to study the new items you will have. Of course, I’m also always happy with all the sensational secrets you serve. Some 4 ideas on this page are truly the best we’ve ever had. My spouse and i got very relieved that Raymond could complete his survey through the precious recommendations he was given from your very own blog. It is now and again perplexing to simply find yourself freely giving things which often others have been selling. We really do know we now have you to appreciate for this. All the explanations you have made, the easy web site navigation, the friendships you assist to engender – it’s got mostly sensational, and it is letting our son in addition to us recognize that that subject matter is interesting, which is certainly exceptionally indispensable. Thank you for all! I intended to post you that very small word to be able to say thank you the moment again just for the wonderful information you’ve contributed on this website. This is certainly surprisingly open-handed with you to make freely all a few people might have sold as an ebook to make some cash for their own end, especially considering the fact that you might have done it in the event you considered necessary. These basics in addition worked as the great way to realize that some people have similar keenness similar to my personal own to know the truth many more when considering this condition. I am certain there are millions of more fun sessions ahead for those who scan through your site. My wife and i got really glad Louis managed to do his survey because of the ideas he grabbed through the web page. It is now and again perplexing to simply find yourself giving out solutions other folks may have been selling. And we know we need the writer to thank because of that. Those explanations you’ve made, the straightforward blog navigation, the relationships your site aid to instill – it’s got everything wonderful, and it’s really letting our son in addition to our family believe that that theme is enjoyable, which is exceedingly essential. Many thanks for the whole lot! I wanted to post you a bit of remark so as to thank you very much over again for your personal amazing opinions you’ve discussed on this page. This is simply tremendously open-handed of you to give unreservedly exactly what many individuals might have offered for an electronic book to generate some dough for themselves, specifically given that you might well have tried it if you ever desired. Those advice additionally served to be a great way to be certain that most people have the identical dreams just like mine to grasp a good deal more in respect of this condition. I’m sure there are lots of more pleasurable moments up front for many who look over your blog post. I as well as my guys came looking through the best secrets and techniques on your web site and all of the sudden I got a horrible suspicion I never expressed respect to the web site owner for those secrets. All of the ladies happened to be as a result excited to see all of them and have now definitely been loving these things. Appreciation for getting so helpful and also for considering certain magnificent resources most people are really needing to learn about. Our sincere apologies for not expressing appreciation to earlier.